Before you read on, I must preface this piece with the fact that I originally wrote this for Being Latino and am sharing it with you here because 1) I really enjoyed this book and 2) I didn’t feel like rewriting it. I hope you enjoy and that you share your thoughts with me. Loss. Fixation. Obsession. Discovery. Revelation. 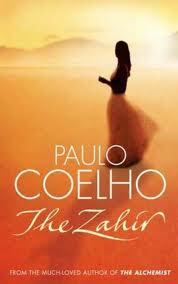 These are some of the topics that you will encounter as you embark on the pilgrimage that Paulo Coelho’s The Zahir takes you on. It is the story of a world-renowned author (I detected what could be potential auto-biographical elements), who has a wonderful wife and “everything” you could wish for and it is only her disappearance that makes him realize that he lost not only her but also who he was as a person. Part of the point of life is discovering what your true path is and how who you are relates to your likelihood of fulfilling that goal. This journey can be filled with obstacles and distractions that take you on detours. When we stray to far it always seems that it takes losing everything in order to wake up from the “reality” that we created. I often wonder why it always takes losing everything. But even when we know deep down that we have strayed from our true path, we cling to the reality we have created and in the process risk losing ourselves for the sake of maintaining appearances and adhering to social expectations. The author of The Alchemist takes you on a journey that encourages a contemplation of where your life is at this moment and emphasizes that you let go of your personal history by sharing and telling your stories. In doing so, your past will no longer have a hold on you. It can be daunting to share our stories, our mistakes, anything we would prefer others not know, but by doing so we let go of the feelings associated with these stories and allow for love to enter our lives. Additionally, we are able to realize that we have more in common with each other than we thought. The fear of a “mundane” life is something that we yearn to avoid and yet it always seems to happen. What would our world be like if we discovered our own paths daily and inspired and pushed each other to be who we truly are? You might say that it’s wishful thinking on my part, since we aren’t all at the same stages of mental and spiritual growth and we aren’t all dedicated to the same goals. It would also require us to relinquish any attachment to jealousy, envy and mean-spiritedness. The truth is that when you’re reading this book and considering how it might (or might not) affect or influence your life, remember that every great act starts with one person. That’s all it takes.